I'm happy with my current solution for stitching at 2x...the 95PN. So far have not found anything better. The 95PN is a good margin better than the 85MV at 2x, so it's going to be hard to beat. My issue now is that I'd like to do some even higher res panoramas, and am not sure the best optics for it. My first stitch work was a 3x4 panorama at 3x using the 3xMM objective. It worked well, but when I tried a 2x3 panorama at 2x with the 95PN, the resolution was nearly as good. This makes sense since the 3xMM is only NA 0.09, so is operating at ~f17 at 3x. Not a dragon slayer, and it has some annoying CAs. I have the 105mm f4 3.5x Inspec.x L, which will certainly have the working distance, but with this lens I'll be at f16, not much better than the 3xMM. I can push the WD down to ~50mm absolute minimum and still light the coin well, but I'm worried that the shorter WD and shallower angle will cause issues with lighting if the lens is not telecentric. This was not an issue with the 3xMM, and is probably its biggest advantage. I saw a 50mm f2.8 apo-computar for sale and snagged it, and am hoping that maybe it will work well on a 150mm tube lens. Will be testing that when it arrives. I'm thinking that the Mitutoyo 5X pushed down might cover APS-C at NA 0.14 (effective f/11) and 34 mm WD. At rated magnification, with an APS-C sensor, I've measured telecentricity on the Mitty 5X at about 1 part in 9000 scale change at 40 microns step. No idea what happens when it's pushed down, though. The Mitty may work, though the WD is probably too short. I am not sure I could build a lighting system for it, though it may be possible for smallest coins. Geometry gets in the way sometimes. I found out long ago for chip and wafer images that a dual light tent gives a very uniform light, which was especially important for chips with solder balls which behave like tiny 40~100um spherical mirrors. The drawback is that it wastes lots of light, and one reason why I went with studio strobes. They are available on eBay for less than $25 and come in many sizes. I use a small 300mm inside a larger 500 or 600mm. tent. Light tents can definitely eliminate over-directional lighting, but I want the stitched images to come out similar to my standard images, with "natural" specular highlights, luster, etc as much as possible. This precludes a light tent, which evens out the lighting but "kills" any presentation of luster. My experience doing this work with coins has been that shadows and highlights are extremely important for proper viewing of fine surface details. Too much directionality causes contrast problems, and may fail to illuminate areas of the coin, but too little directionality can quickly obscure a lot of detail, or make it difficult to distinguish incuse from raised features, etc. A good balance is needed to get a "natural" look to the surfaces. Sounds like you need a light tent, in it, with a hole with an adjustable iris and pair of polars for size and brightness? By carefully controlling the light sources (multiples assumed) for the tents you can create gradients in different directions. This is sort of what I do with the lens-mounted diffusers: moving the light closer to the diffuser reduces diffusion; moving around the clock positions changes the apparent directions; and moving closer or farther from the lens changes lighting angles. Problem is for stitching, the light must be attached to the moving xy stage in order to maintain a constant lighting condition, so this makes the whole affair a bit more complex. Chris...missed your response first time around. The lighting must track with the XY table, so must be kept fairly simple. Right now, with the 95PN, I am using a 50mm ID ABS tube, cut to 75mm length, with a section cut out of the bottom to allow easy access to the coin. At the top, I have an Angel Eyes 40mm ringlight, with is a little less than 50mm dia outside. This fits nicely inside the 50mm tube, and is taped in place. Tube is flocked to prevent reflections. The ringlight is actually covered with tape from 3:00-9:00, and from 11:00-1:00, such that only 1:00-3:00 and 9:00-11:00 are exposed and thus shine on the coin. This creates a nearly ideal lighting for the coin, with the direct reflections occurring just outside the diameter of a 19mm Cent. It is the same lighting I use for non-stitched images, and gives relatively large diffusion, with just enough directionality to highlight some luster. Unfortunately, any more diffusion than this fairly conservative method and the coin loses all luster presentation, and thus ends up looking fairly "flat". I could possibly create a dome with a ping pong ball, but I think the source itself will need to be attached to the ball to keep the lighting angles from changing during the panorama shoot. Maybe a couple of small light panels would do the trick, attached to the ping pong ball, which is attached to a small tube? Not sure yet what I can build that is only 29mm tall and attaches to the XY stage. It is a bit of a challenge! Never tried dual tents. Do you place the light outside of both tents, for the sake of double diffusion? Or something else? Yes, that's the idea. I use multiple strobes, sometimes they are diffused also. Works well for getting uniform light on the subject, some directionality can be created by controlling the strobe positions and output. Be aware that the dual tents waste lots of light, efficient it is not!! 3.3x: for 4x6 panorama of a Cent-sized coin on APS-C with reasonable overlaps and extent beyond the coin. This is the easiest combo for the 5x. 3.0x: for 2x3 panorama of Cent on FF. This is a tough job. 2.7x: for 3x4 panorama of Cent on APs-C. Easier than 3x on FF but still a tough job for the 5x. I have reconfigured the system to test the 105IXL3p5, and will report some results when available. I'm thinking it may be the only solution I own that can do 3.0x on FF, and while this was not a stated requirement before, after doing some larger SnS work ( I did a couple 3x4 panoramas for fun) I am strongly leaning toward minimizing the total number of images in the panorama...just to keep the workload reasonable. 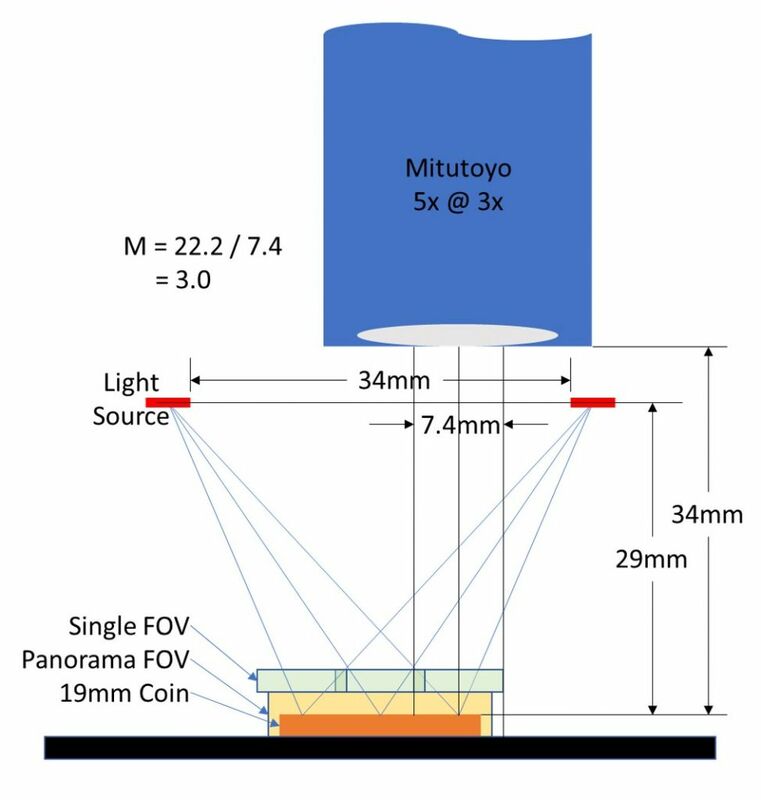 I'm OK with the work required for 2x3 panorama, and it makes a lot of sense from perspective of efficiently converting the 3x2 sensor aspect ratio to the 1x1 coin aspect ratio. Ray, what is the 105IXL3p5? Sorry, it's my shorthand for the Linos 105mm f4 Inspec.x L 3.5x inspection lens. My tests so far show that it's just about as sharp in the center as the Mitutoyo at ~3x, shows great CAs, and has no rolloff at the corners of APS-C. It may even be slightly better in the corners than in the center. It needs an annoying amount of extension though, ~15" to get to ~3x.